I listen to my iPod. Ha, just kidding: I always listen to my iPod whenever I’m walking to work/yoga/sightsee/meander. Know what else I do, though? I pretend the music I’m listening to is a soundtrack and I’m an awesome character in a movie. Then what? Let me tell you. I’m happy to share. In my soundtrack-accompanied movie (in which I’m at least a co-star), I can break into sweet and magnificent dance moves. I can do back handsprings, wicked split jumps and all the cool stuff that you see in the silhouettes at the beginning of So You Think You Can Dance? Sometimes, I catch myself thinking I can actually do these things. Luckily, I can usually catch myself before attempting to disembark from gravity with disappointing results, albeit perfect musicality and rhythm. Does anyone else ever have daydreams like this? Am I the only one who is filled with the gentle hope that they are more awesome than reality will general allow? Also, I did some errands today. Since Adam’s gone to Seattle for the weekend, I got some groceries I wouldn’t want to carry on foot. I also got some chips. I’m pretty excited. 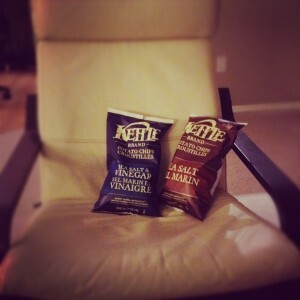 Don't worry—I won't be lonely while Adam's gone: Meet my friends, Salt and Vinegar.